Investors, collectors, and even history buffs, often look for rare coins and precious metal products to add to their portfolio. Liberty Gold Quarter Eagles are among the rarest coins in the world, due in large part to the financial impact of the Great Depression. Right now, Pre-33 $2.50 Liberty Gold Quarter Eagles are available from Silver.com. Ships in a plastic flip. Available in About Uncirculated, or Almost Uncirculated, condition. Struck by the United States Mint with a $2.50 (USD) face value. The drive to bolster the nation’s gold reserves in 1933 resulted in the collection and melting of the vast majority of US gold coins in circulation at the time. Today, Pre-1933 gold coins that survived this collection are rare, and are sought after by investors, collectors, and history buffs for their historical value as much as their monetary value. Each of these Pre-33 $2.50 Liberty Gold Quarter Eagle coins is available in Almost Uncirculated condition. A coin in AU condition has only slight signs of wear, and when graded on the Sheldon scale, is often numerically graded between 50 and 58. Many of these coins maintain some level of luster from the mint. On the reverse side of each coin is Gobrecht’s depiction of the heraldic eagle. 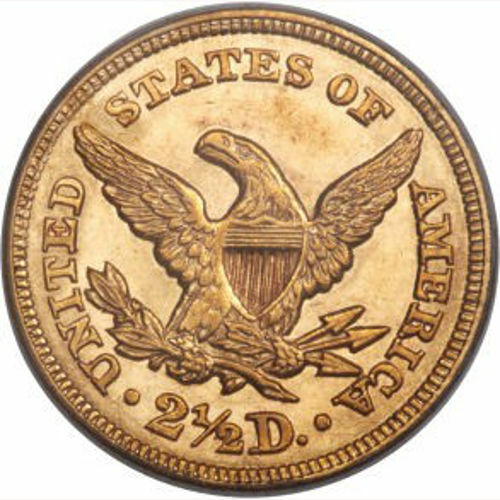 Common on modern American coins, this image features a bald eagle with its wings spread wide, and a small shield on its chest. It clutches arrows in one talon and an olive branch in the other. The obverse side of the coin bears a depiction of Lady Liberty. Inspired by a Benjamin West painting, Omni Vincit Amor, the image shows Lady Liberty in left-profile relief with a crown atop her head. In the crown, the word “Liberty” is engraved, while 13 stars encircle her image. The United States Mint produced these coins between 1840 and 1907, with various mints contributing to production during that period. San Francisco, New Orleans, Dahlonega, Charlotte, and Philadelphia all struck $2.50 Liberty Gold Quarter Eagles. If you have questions for Silver.com associates, we encourage you to contact our associates at 888-989-7223. We’re also available online via our live web chat and through email. Looking for similar products? 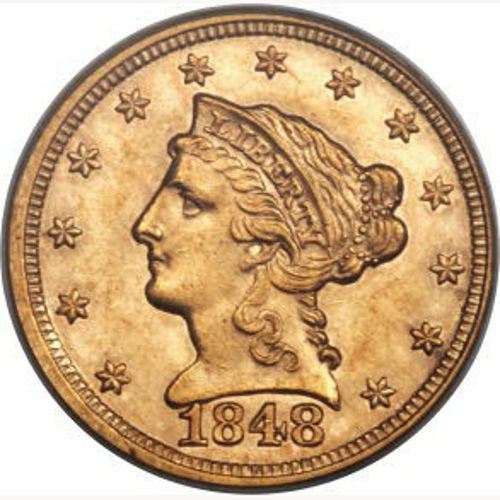 Check out the Pre-1933 Gold Coin page of Silver.com.